The Olympic flame reached the Acropolis on Thursday after an unprecedented journey across five continents and will rest among its ancient temples before launching the Athens Games on Friday. 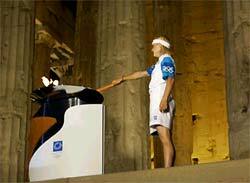 Nine-times Olympic gold medallist Carl Lewis handed the flame to Greek high jumper Niki Bakogianni, a silver medallist at Atlanta in 1996, who lit a cauldron amid the 2,500-year-old temples on the hill overlooking Athens. Lewis had carried the torch, modelled like an olive leaf, to the steps of the Acropolis, cheered on by thousands of Athenians and tourists. Some waved small Greek flags. "Tonight the flame illuminates the Acropolis, the ultimate symbol of Greece and Greek civilisation," said Games chief organiser Gianna Angelopoulos. "This journey is the history of the Athens Games -- a bridge between the ancient and the modern -- reminding the whole world that Greece is where democracy, philosophy and the Olympics were born," she said. International Olympic Committee officials, Greek President Costis Stephanopoulos and Prime Minister Costas Karamanlis were among officials at the ceremony. Greece's former King Constantine, who makes only rare visits to the staunchly anti-royalist country, was in the audience. Underlining the tight security at the Games, helicopters hovered over the Acropolis and police with bomb-sniffing dogs combed the area. an amazing place to be, there is so much history here," Lewis told Greek ERT television. The flame will burn overnight just outside the Parthenon, most majestic of the temples crowning the hill and dedicated to the goddess Athena, protector of the city. Brainchild of Athenian statesman Pericles, the temple was finished in 432 BC, three centuries after the Olympic Games began. It was decorated by the most celebrated sculptor of his time, Pheidias. Damaged by earthquakes, wars and even misguided restoration efforts, the Acropolis monuments have been undergoing extensive restoration in the past few decades. The Parthenon still bears the heavy scars of a 1687 attack by a Venetian admiral fighting the Ottoman Turks, then rulers of Greece, who used the temple to store ammunition. Lord Elgin took many of its sculptures, better known today as the Elgin Marbles, to London in 1803 where they remain in the British Museum despite Greek demands for their return. For the Olympics, the Acropolis has had new lighting to showcase the finest examples of the Golden Age of Athens -- the era that gave the world democracy and philosophy. A lift has been erected on the hill, surrounded by giant walls that myth says were built by one-eyed Cyclopses, to accommodate visitors with disabilities. The Olympic flame was lit in March at Olympia, ancient site of the first Games southwest of Athens, by white-clad priestesses. It has since been carried by land, air and sea through 33 cities across the world. Dragon boats, helicopters and a replica of a trireme -- an ancient Greek warship powered by oarsmen -- were among the methods of transportation used.